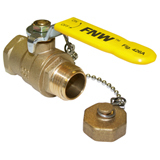 * The pressure/temperature ratings indicated are for the valve body only. Hose side ratings are dependent on the type of hose connected by others. ** The included cap is rated to 50 PSI maximum. The primary purpose of the cap is for protection of the hose connection threads. For safety concerns, removal under pressure is not recommended.